Welcome the Holiday Season with Snowmania, a 111% Match + 33 Spins! Have yourself a winning holiday season when spinning our newest slot Snowmania! 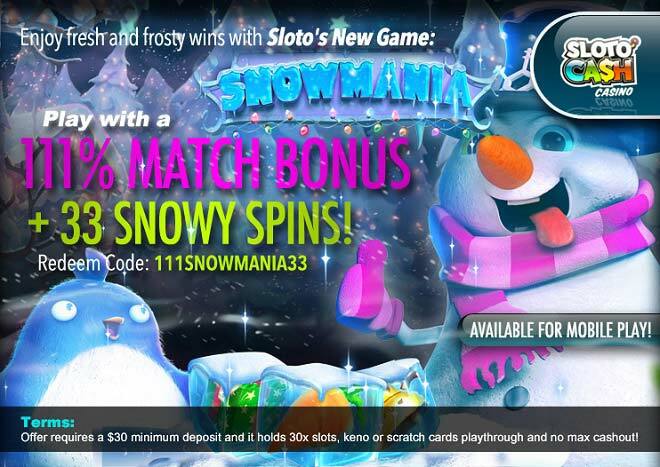 Christmas is certainly in the Sloto Cash air and you'll feel it take over you when you deposit as little as $30 to play Snowmania with a 111% Match + 33 FREE Snowy Spins! Keep warm during the winter months with wins that occur from spinning the 5 reels and 20 paylines of our icy and highly entertaining new slot. Christmassy music and symbols will get your holiday spirit going in no time as you create winning combinations and defrost the icons trapped in ice cubes. Whenever a winning combo occurs, the ice cubes will shatter and wins with multipliers will land your way. Have yourself a super winning Christmas time this November and beyond when you deposit as low as $30 to play our Snowmania slot with a 111% Match Bonus + 33 Snowy Spins!